The Geocon cyclist is now more warmly (and sensibly) attired. Photos: B Cranston. 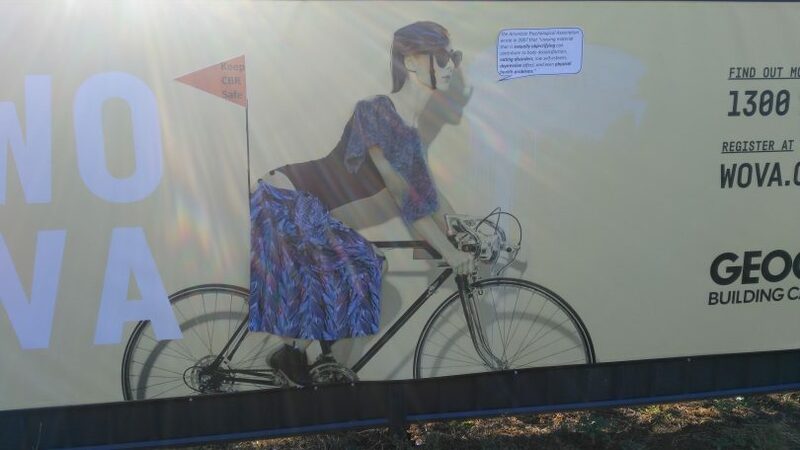 If you thought that the woman in a high-cut swimsuit, improbably riding a bicycle, looked uncomfortable on the Geocon development hoardings at Woden, good news: a concerned Canberran billboard activist has intervened. Along with many an actual Canberra woman, she now sports a warm skirt and what appears to be either a comfy cardigan or a poncho. Also, some shoes, a sensible bike helmet and a bike flag saying Keep CBR Safe. The original billboard at Woden. Photo: I Bushnell. A sharp-eyed reader spotted the additions to the billboards on Melrose Drive, which included a speech bubble quoting the American Psychological Association to the effect that viewing material that is sexually objectifying can contribute to body dissatisfaction, eating disorders, low self-esteem and other damaging effects. The nearby bloke in a suit also has a thought bubble with a Me Too hashtag, and there’s even some written material pointing out that the under ACT legislation regarding billboard advertising, the hoardings should be regarded as illegal. 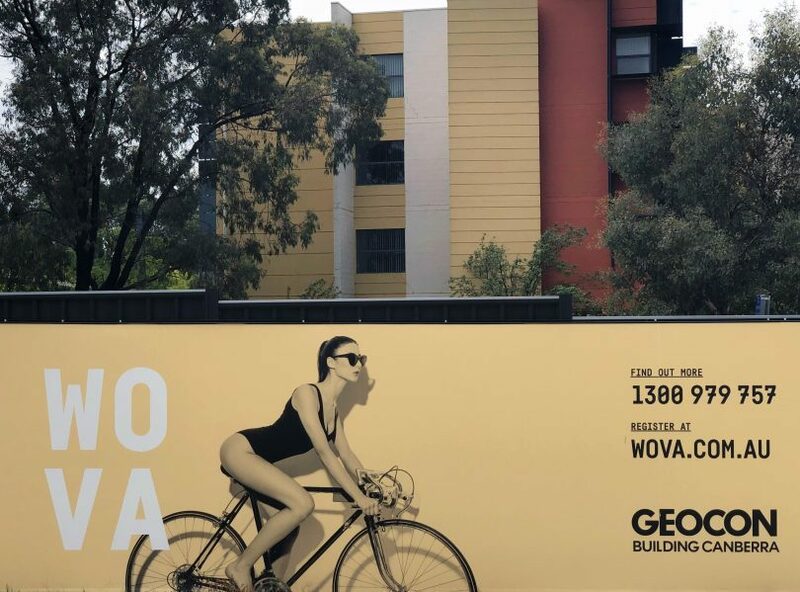 Geocon has been the subject of ongoing criticism from community members who say the advertising focus on scantily clad women is demeaning, inappropriate and entirely unrelated to the apartment development. A complaint has been lodged with the Advertising Standards Bureau, but Geocon has responded by saying the woman represented the “aspirational, chic lifestyle” they aim to create at the former Woden Tradies Club site. Whether it’s aspirational, chic, or indeed even sane to ride a bicycle barefoot and bareheaded, in swimwear usually associated with 1980’s men’s magazines, is a matter for individual judgement. But as the weather turns, for now at least she’s far more sensibly dressed. This is the best kind of graffiti.